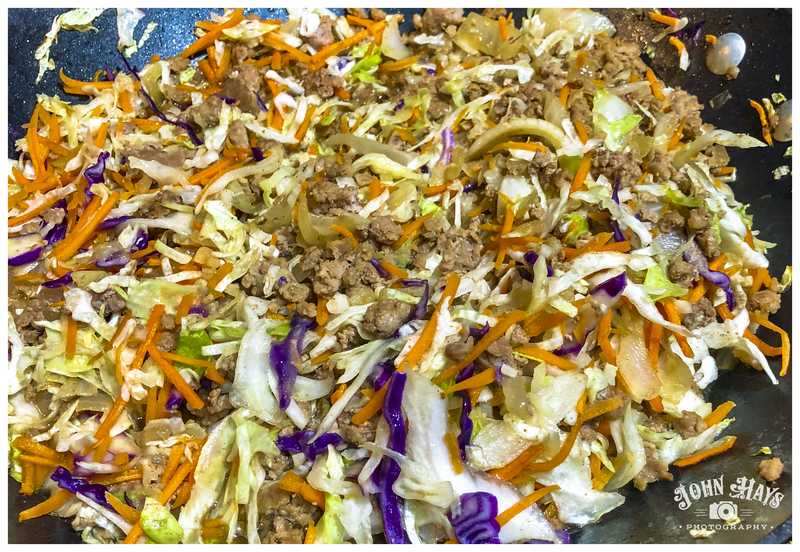 If you love egg rolls and / or cole slaw, you’re gonna LOVE this! Add white parts of green onions, onion, and garlic and saute, stirring frequently, until onion begins to soften, about 5 minutes. Add ground pork, grated ginger, and 1 tbs hot sauce and cook until pork is browned, about 7-10 minutes. Add coleslaw mix, coconut aminos, rice wine vinegar, white pepper, and salt to taste, and stir until well combined. Cook, stirring regularly, until cabbage is tender, about 5 minutes. Meanwhile, in a small bowl whisk together 1/4 cup mayo and 1-2 tbs compliant hot sauce. Add a pinch of salt, to taste. To plate: spoon a hearty helping of the pork-cabbage mixture in a serving bowl. Drizzle creamy chili sauce over mixture. Garnish with green parts of the green onions and black sesame seeds.